• Magnetic Fields around Conductors. A conductor carrying an electric current will produce a magnetic field around the conductor as shown in Fig.3.1.1. This field has a circular shape and exists along the whole length of the conductor. Because of its circular shape, the magnetic field does not have specific north or south poles, but is considered to flow in a continuous circular loop towards an undefined north pole. Right Hand Grip (or Curl) Rule. The direction of a magnetic field around a conductor can be remembered using the right hand grip rule shown in Fig 3.1.2. Imagine grasping a conductor in the right hand as shown, with the thumb indicating the direction of conventional current flow from positive to negative. The fingers of the right hand, curled around the conductor indicate the direction of flow of magnetic flux. Fig. 3.1.1 Magnetic Field Around a Conductor. Fig. 3.1.2 Right Hand Grip Rule. Magnetic Fields Around Parallel Conductors. 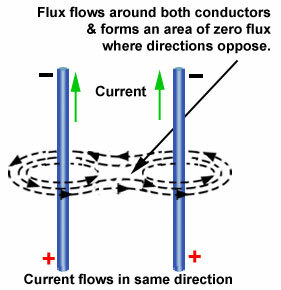 If two parallel conductors carry the same current, the direction of the magnetic fields around each conductor will interlink and oppose each other between the conductors as shown in Fig. 3.1.3 forming an area of zero magnetic flux (no flow) between the conductors, this happens between adjacent conductors around the axis of a coil. 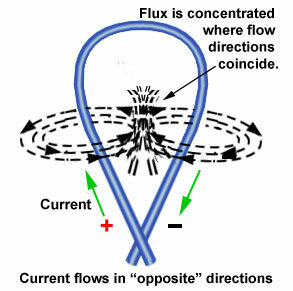 When the conductor is bent into a loop or coil however, the direction of the magnetic fields inside the coil coincide, concentrating the magnetic flux within the coil as shown in Fig 3.1.4. Fig. 3.1.3 Magnetic Field Around Parallel Conductors. Fig. 3.1.4 Magnetic Field Around Looped Conductors. Fig. 3.1.5 Magnetic Field Around a Solenoid and a Bar Magnet. 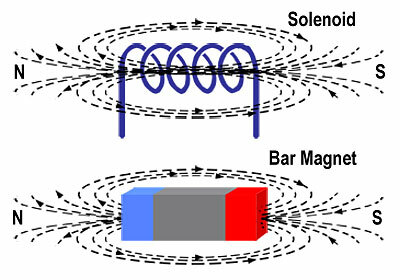 When wire coils are formed into a series of continuous loops called a solenoid, the effects decribed above produce a magnetic field pattern that is similar to that around a bar magnet, as shown in Fig 3.1.5. Increasing or decreasing the current through the inductor increases or decreases the strength of the magnetic field, giving the effect of a bar magnet, but with a variable field strength. This changing magnetic field can have several effects. It can be used to produce movement, for example in electric motors, or it can be used produce electrical effects in other conductors affected by the field. As this module deals with AC signals in static components such as inductors and transformers, (rather than moving machines such as motors or generators) the effects described relate changes in the magnetic fields around static inductors, to changes in current through the those inductors. 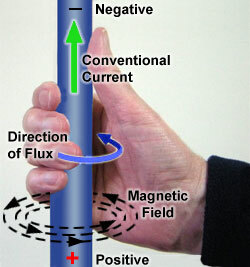 Magnetic Flux is the name given to the magnetic equivalent of electric current. It is the flow of magnetism from the north to the south pole of a magnet. 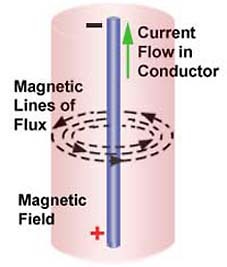 Magnetic Flux flows along lines of magnetic force that make up a magnetic field. Just like electric current, it is easier for magnetic flux to flow through some materials than others, soft iron for example has a very high permeability. That means, it is very easy for magnetic flux to flow through it. High permeability can also be described as a very low reluctance to the flow of magnetic flux, (reluctance is the magnetic equivalent of resistance). Air has more reluctance and so is less permeable than iron. It is therefore easier for a flux to flow through iron than through air, and many electromagnetic devices use materials such as iron to concentrate magnetic flux into a small area and so increase the effectiveness of devices such as transformers, motors and electromagnets.